Norma was only seventeen years old when a gas explosion at her home in New Mexico left her with burns on over 80% of her body. Although she began her healing process at Shriner’s Hospital for Children in Galveston, Texas, the hospital closed its doors, delivering another blow to Norma; it was the only hospital in Texas with a burn unit. Norma remembers, “That was like a second home to me. You can feel really comfortable in there. No one watches you like you’re different.” Although she received further care at Shriner’s Hospital in Houston, it could not offer her the same sense of lost community, because it did not have a burn center. Norma, however, did not give up. 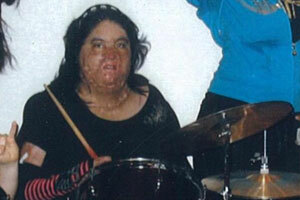 She started playing the drums through Shriner’s music therapy program, led by therapist Christine Neugebauer. Neugebauer contacted our founding director, Sam Davis, who donated a new set of drums to Norma, after her own set was destroyed by Hurricane Ike. Now, Norma rocks out to her favorite bands, including The Strokes, The Red Hot Chili Peppers, and Nirvana, and hopes to help other burn survivors heal through music.